It’s not the $19B price tag of Facebook’s WhatsApp acquisition that’s most amazing to me. That’s just math (lots of math). More users * more engagement * a wealthy/desperate suitor = bigger deals. It’s not most amazing to me that the deal works out to over $250M per employee, if evenly split. For comparison, Google seems to be worth about $8.5M per employee, last I checked. Apple reportedly pulls in a whopping $2.3M yearly per employee in revenues alone. (average Apple employees, how much of that do you get paid again?). WhatsApp just did more and faster with fewer people. That’s what makes a great team. I’m sure everyone was amazing. Dysfunctional teams or people barely earn back their salaries, if they survive at all. The motivation for the deal is not amazing at all, since Facebook desperately needs to connect the very people who don’t need Facebook to connect, i.e., the people you see every day. It seemed almost inevitable, given the trends. No. 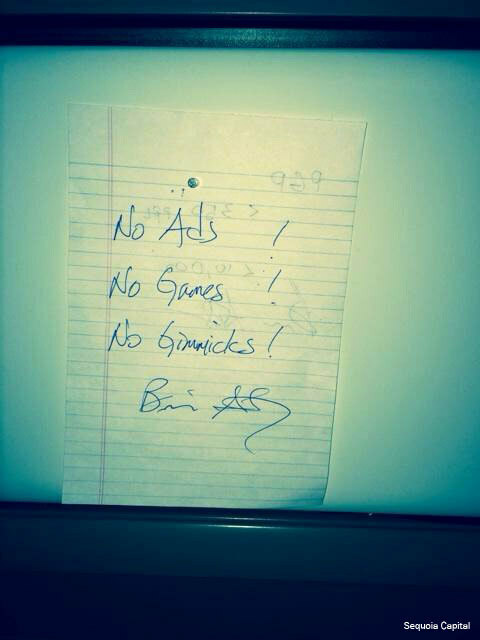 What is most amazing to me is the powerful principle behind this simple note at right — one of the core principles that apparently made WhatsApp so popular with hundreds of millions of users. I found this via the Sequoia blog post about the sale, and I honestly had no idea. It’s most amazing to me, and most inspiring, because there are so many professional CEOs and advisors out there who try to convince their startups that they need to collect and hoard as much user data as possible, then sell it surreptitiously, while also pushing ads and wringing every last monetizable cent with games and gimmics to keep people addicted and virally engaged. Those same fine folks somehow duck out (or get fired) when the users finally complain, defect and disappear. And they apparently never learn from their mistakes. But they do come back, with the same tired story again and again. WhatsApp proved them wrong and proved it 19 billion times over. Build value for users. Give them what they want and need, every day. That’s the recipe for success. This kind of success is something I can truly appreciate and admire. P.S. I’d like to think that this is the real reason Facebook bought them, given FB’s reliance on those same tired ads, games, etc… Maybe it wasn’t for more European and emerging market penetration. Maybe it wasn’t merely to disarm a growing competitor. Maybe it’s for Facebook to become more like them? Maybe that’s why they put Jan on the board. If so, good for them.